Health and fire safety awareness begins very young and continues throughout our lives. Thats right! We offer tours to suit your needs. Remember to ask our teachers and parents if your class can come visit us at our fire station, or when we can come and visit you at your school. To schedule a tour call (360) 384-0303. Every Halloween eve since 2005, we have opened our doors at the Church Road and Northwest fire stations to offer treats, warm cider and coffee, a dry and warm environment, and take photos . We hope to see you this year! 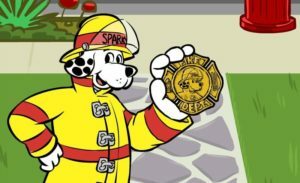 Sparky says, "Search for Safety"